This tutorial describes an easy and versatile two-column tie. A two-column tie is any tie that ties two parallel things together, such as two arms, or two legs, or an arm to a leg, or a leg to a post, or whatever. This particular two-column tie is very fast and simple, looks gorgeous, and requires no knots. For the purposes of this tutorial, I'm going to show you how to tie your partner's arms together with a no-knot two-column weave. You can do the same thing with your partner's legs, or an arm and a leg, or whatever. This is not a load bearing tie. It should not be used by itself for suspension, especially not in a situation where your partner's weight would be suspended by this tie perpendicular to the ground. In other words, don't try to tie someone's arms together and then suspend them by the arms this way.. Fold the rope at the middle. Lay the rope beneath your partner's arms near the wrists. 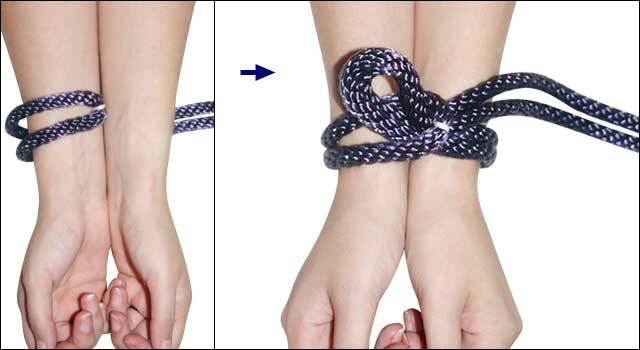 Place the loop on top of your partner's arms as is shown below. The concept of a "loop" is important here, and one we'll keep coming back to. Essentially, you are going to push the rope through the loop to make a second loop, then bring the rope back underneath your partner's arms, then push the rope through the second loop to make a third loop....but I'm getting ahead of myself. So. Put the middle of the rope over your partner's wrists. Now take the rope and push it through the middle to create a loop like you see in the right-hand side here. Describing it is much more complicated than actually doing it, I promise; when you get going, it's easy. Don't pull the rope tight. Instead, just hold on to the loop and bring the rope back around under your partner's wrists again. Then push the rope through the first loop you made, to make a second loop. Again, it's a whole lot simpler than it looks; this is one of those things that when you try it, you'll find it's really easy. You're just going to keep doing this over and over. Bring the rope around your partner's wrists, push it through the loop to create another loop, bring it back around, push it through the loop to create another loop, over and over. The only trick is to make sure that you don't twist the rope; make sure it lays flat against your partner's skin. Don't make it too tight; you should be able to stick a finger under the rope. You don't want to cut off circulation! And that's it. Just keep repeating this all the way up. When you get to the top of whatever you're tying together, there are a few ways you can finish. The simplest thing is just make a knot at the last loop. Or, if you have a lot of rope left over, just take the two ends of the leftover rope and run them down the inside of the weave. 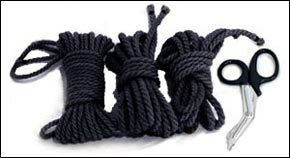 If you want to get even fancier, take the two ends of leftover rope and go over the first turn of rope around your partner's wrists, under the second, over the third, under the forth, and so on. Again, sounds complicated to explain, but it's really very simple. The whole beauty of this weave is that it looks really complicated but it's not. Once you see how easy this tie is, you'll probably find uses for it beyond tying your partner's arms together. You can tie an arm to a leg or tie your partner's legs together, as I mentioned above (tying your partner's legs together for the evening can be fun, since then you get to watch him or her hop around). Another use for his tie is to make a rope corset. Start at your partner's waist and work your way up; you can do it with the weave in front or in back. If your partner is female, run the weave up to just beneath her breasts and tie it off between her breasts. You can place your partner's arms around a post and then tie them together in front of the post, which will prevent your partner from going anywhere. (This can be a fun way to tie someone to a whipping post for spanking or flogging.) You can tie both the arms and the legs of your partner, then have him or her lie face down on the bed for a spanking as well. Some people are flexible enough that you can tie their arms this way behind their back, though if you want to do this, you should take care to ensure that your partner is physically able to do it and keep in mind that this position can rapidly become fatiguing. A little bit of experimentation will probably turn up all sorts of other creative uses for this lovely tie. Enjoy!